The West gives itself a clean chit while blacklisting the BRICS and the rest despite the fact that secrecy havens under Western jurisdiction are the major drivers of corruption worldwide. They are helping the global economy make a soft landing during the recession, but there is another key area in which the BRICS are ahead of some of the leading democracies – financial secrecy. According to the UK-based Tax Justice Network’s Financial Secrecy Index (FSI) – which ranks jurisdictions according to their secrecy and the scale of their activities – Switzerland is the most secretive territory in the world with an FSI value of 1765. The United States, Singapore, Germany, Japan, UK and Canada figure in the top 21 countries. On the other hand Russia at 25, Brazil, 29, and India at No.32 have much lower FSI values – that is, they have fewer secrecy laws to facilitate illicit financial flows. The outlier is China, which wasn’t covered by the survey, but the Chinese territory of Hong Kong is up there at the No.3 spot. What these arcane numbers add up to is that the current global banking system is facilitating and encouraging corruption around the world while at the same time sucking wealth from poor countries and transferring it to the rich West. According to the authors of the FSI, an estimated $21 trillion to $32 trillion of private financial wealth is located, untaxed or lightly taxed, in secrecy jurisdictions around the world. Nearly all of these tax havens are under Western jurisdiction. As well as the example of notorious Switzerland, these include Luxembourg, Cayman Islands (UK jurisdiction), Jersey (UK jurisdiction), Panama, Bermuda (UK jurisdiction), Guernsey (UK jurisdiction), UAE, Mauritius (which facilitates black money re-routing to India) and British Virgin Island (UK jurisdiction). Basically, secrecy laws encourage people to extract wealth from their countries and deposit it abroad where the money works for someone else. When wealth flows out, instead of depending on tax, many countries are forced to depend on foreign aid. This cycle has continued for decades. 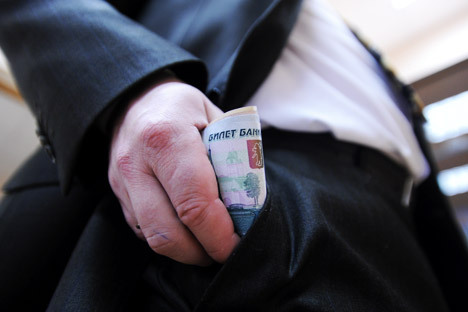 Last month Transparency International published its annual index of corruption. The Berlin-based agency, which has the last word on sleaze, says Switzerland, Luxembourg and the UK are in the least corrupt category. In fact, all the Western countries are shown as remarkably corruption-free. The list is predictably topped by third world countries, mostly from Africa. From the BRICS, Russia and India are listed among the most corrupt nations and Brazil, China and South Africa are in the moderately corrupt group. The World Bank also adds its two bits, saying “$20 billion to $40 billion are stolen from developing countries each year". The well-publicised court cases involving Vodafone and ITC, which are accused of avoiding billions of dollars in taxes in India, vindicate Hickel’s assertion. Also, BP getting the boot from Russia is a result of the British company’s unbridled greed for resources. The situation is so dire that the more than 30 per cent of global foreign direct investment is booked through tax havens. “This is a massive – indeed, fundamental – cause of poverty in the developing world, yet it does not register in the mainstream definition of corruption, absent from the UN Convention, and rarely, if ever, appears on the agenda of international development organisations,” says Hickel. So is Transparency International’s index gamed? Why not? Is there any reason to believe it is bias-free when it does not factor in the massive corruption that is part of the City of London or the bribing of Iraqi officials by the United States? The LIBOR scandal of 2012 revealed the magnitude and extent of gaming by British banks that fix interest rates. When the scandal broke, more than $800 trillion in financial products were riding on LIBOR. That’s 10 times the size of the world’s GDP. It meant hundreds of millions of homeowners, investors and businesses were paying the wrong interest rate. If the rates were gamed by just 0.01 percent the total losses would have been in the region of $800 billion, or two and a half times the GDP of Greece. Things are no better in other parts of Europe. In 2012 a poll by Eurobarometer showed that 74 per cent of Europeans thought corruption was a major problem in their country. The results showed around 20 million bribes were paid to officials in the 18 European Union nations covered by the report. The European Commission estimates the cost of corruption is equivalent to 1 per cent of EU GDP, some $156 billion. Clearly, the representatives from Western democracies and think tanks who offer country ratings and character certificates, besides publishing tomes on how corrupt the third world is, need to be given a long walk on a short plank.